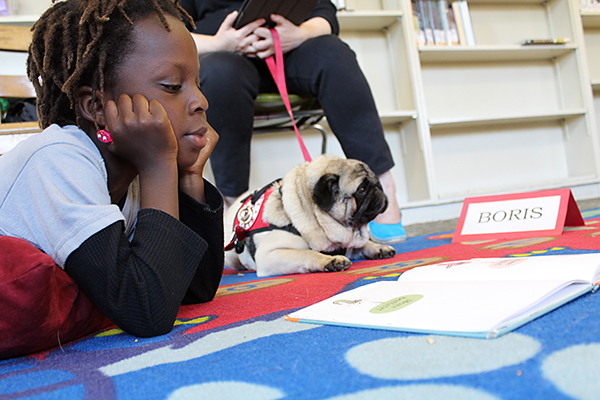 Galvanized by a national reading campaign, communities across California are launching innovative partnerships that are resulting in new early literacy programs in schools, libraries and even laundromats. 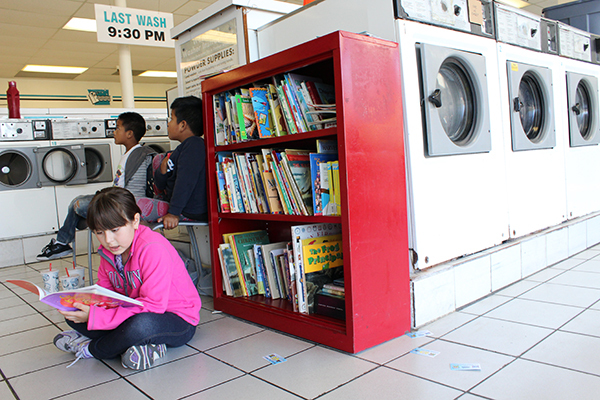 “There’s a lot of books here, really good books,” said 9-year-old Melanie Garcia-Macias, who sat with her back to a big red bookshelf at the end of a long line of washing machines at the Clean Express Coin Laundry in Richmond one recent Wednesday. A copy of “The Night Before Christmas” was splayed open on her lap. The plan – giving students free access to engaging titles while their parents fluff and fold – is just one of the ingenious ways communities are opening doors to literacy through the national Campaign for Grade Level Reading, sponsored by the Annie E. Casey Foundation. Children who are not reading on grade level by the end of third grade – 53 percent of California’s children – are four times more likely to drop out of high school, according to research by the foundation. That correlation, which the foundation first wrote about in 2010, kicked off the Campaign for Grade Level Reading. The campaign offers information, technical support and access to fundraising opportunities so that community leaders can better organize around the goal of improving literacy in young students. Listen to Mongeau’s companion story to this piece on KQED’s The California Report. Communities that join the campaign do not get direct financial support, nor are they given specific objectives. Rather, they are asked to collaborate with other local groups on projects concentrating on early education, chronic absence and summer learning. That flexibility has allowed the 17 participating communities in California to tap into their creativity to help boost students’ reading levels – like the program operating in the laundromat in Richmond’s low-income Nystrom neighborhood. The books, donated by residents and the Richmond Library, belong to a system of “take one, leave one” bookshelves placed in businesses throughout the city by local literacy group West County Reads. Children are encouraged to bring borrowed books back and trade them in for new ones, but there’s no penalty for keeping the books at home. The program has given out 15,000 books so far this year. The bookshelf at Clean Express is pretty hard to keep stocked, said parent volunteer Tana Montero. Montero would know. She lives in the Nystrom neighborhood with her children and works at a local charter school. She suggested the Clean Express to West County Reads staff when she heard they planned to place bookshelves around town – which is exactly the kind of community collaboration the campaign encourages. “The local communities understand and know their issues and challenges the best, better than anyone else,” said Alicia Maldonado, spokesperson for the national campaign in California. Not every community has created new programming as a result of the campaign. Some places, such as Oakland, Los Angeles and San Francisco, already have significant pro-literacy programming in place. For those communities, the benefit of becoming involved in the national campaign has meant a chance to align the efforts of multiple agencies. In other communities, the campaign has had a more direct impact. In Fresno, for example, the head of the public housing authority was so swayed by what he heard about the importance of reading on grade level by third grade that he formed a partnership with First 5 Fresno to bring AmeriCorps volunteers into the housing developments and work with parents and young children on pre-literacy activities like reading together and creating artwork. Stockton librarian Suzy Daveluy said she knew children in her city were struggling with reading, based on the number of help requests she got from parents. But she didn’t realize how bad the literacy crisis had become until she met with national campaign leaders. “What I can credit the campaign with is opening my eyes up to some of the realities that our children are facing,” Daveluy said. She decided to take the library’s summer reading program to a new level. Students had always been able to sign up and win small prizes for reading a certain number of books, but Daveluy felt that wasn’t enough. This summer, she decided to do something about it. She started by tapping into some of Stockton’s known resources: its teachers and teenagers. Daveluy asked teachers to recommend children in grades kindergarten through three who were struggling with reading and writing, and worked with a retired teacher to plan a 10-week tutoring curriculum. Then she recruited and trained 25 teenage volunteers to teach the classes. Now, 35 to 45 students show up at the library three times a week for hour-long sessions to work on their reading in groups of three or less. The result, on a recent day, was organized chaos. Irene Cruz and Alissandra Soriano, both 7 and headed to third grade, sat at one table reading a book aloud, trading off paragraphs, while their 15-year-old tutor helped them pronounce the harder words. At another table, a tutor used white boards to help her students learn about consonants and vowels. 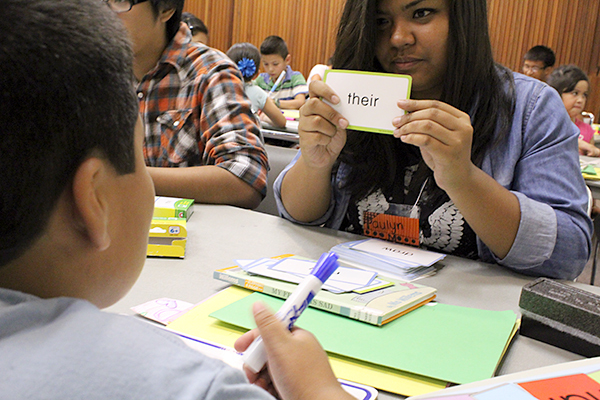 “A, E, I, O, U and sometimes Y,” soon-to-be third grader Xavier Reyes, 7, recited, then looked at his tutor. She held up her hand for a high five. The boy grinned, slapped five, and turned back to his work. At yet another table, Azeneth Perez and Luis Barrera, both 8, responded as quickly as they could to flash cards containing “sight words,” words children their age should know at first glance. Azeneth, who will start fourth grade in a few weeks, shouted out a series of answers, then told her tutor that this set of cards had grown too easy. The teen smiled and went to find a box with a larger range of words. The participating children were given the San Diego Quick Assessment, a standard literacy test, on the first day of the program to determine their current reading level. The test consists of 10 sight words per grade level, starting with words such as “on” and “all” on the preschool level and moving up to more complicated words. Tutors keep track of the words the children read correctly and track how far into the lists they are able to progress. When the Stockton students were tested five weeks after their tutoring had begun, most of those who had been attending regularly had already moved into the word list for the next grade level. Selena Durell started bringing her 6-year-old daughter, Olivia, to the program because she was worried about her daughter starting second grade. Durell knew the girl was behind, but couldn’t afford tutoring sessions to help her catch up. “I’m so ecstatic that they are offering free tutoring, because usually you have to pay for something like this,” Durell said. Olivia is caught up now, her mom said, and thinks reading is fun. She’s even checked out books to bring home and read to her cousins and friends. The little girl still isn’t big on complete sentences, but when asked to talk about the people who are helping her this summer she becomes positively verbose. So after 5 weeks at 3 hours a week (15 hours) children were already up a grade level on sight words. My question is what is preventing schools from achieving that while having multiple years to do so? The two weeks spent giving the CST alone probably contain pretty close to 15 hours of instruction time…. where are the metrics on that ‘program’ before it got implemented…? 52050.5. (d) To remedy this, the state is in need of an immediate and comprehensive accountability system to hold each of the state’s public schools accountable for the academic progress and achievement of its pupils within the resources available to schools. Please note that it is all “For Our Children.” Please stop questioning the wisdom of our elected representatives. It is undemocratic. Thank you. Ah, I see. Makes sense. Can I vote for these people again? Interestingly, LCFF appears to contain even more specific achievement requirements, including needing to improve every single subgroup performance in order to avoid being placed in the ‘identified for support’ category, and if schools or districts fail to improve outcomes for 3 subgroups in 3 our of 4 consecutive years, they will be labeled ‘persistently failing’ and require intervention. That will be interesting with the introduction of common core. Btw, this thread is about reading, but since I mentioned LCFF, I also noticed that if a single school fails to make progress toward the 24 student average class size, the entire district will lose its CSR grant. Something tells me class sizes will be bargained to avoid this pesky small class size requirement. Losing that funding is just too risky. Too bad that number doesn’t exclude special education. More seriously, I think we substantially underestimate the peer effect in schools and really need to come to terms with it and a solution. IE: what’s different about this group of kids is that this is a voluntary program. No kids that don’t want to be there, or can’t behave, are there. There is nothing harder for a teacher or school to overcome than a knot of disruptive, anti-educational, angry kids, and they don’t have to be a majority, just a critical mass.